In this episode, starting in Jerusalem, the birthplace of the first monotheistic religion, Judaism, the film explores the historic destruction and reconstruction of the Temple. 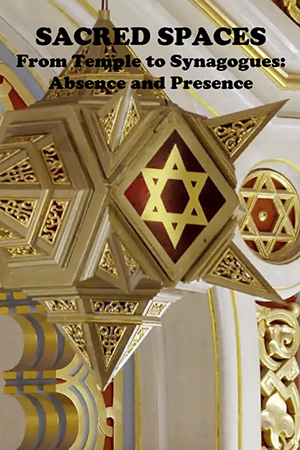 Its undeniable symbolic importance and influence can be found throughout the world when Jews construct their synagogues. On the island of Djerba off the coast of Tunisia, we discover places of Jewish worship which echo the architectural plans of a Mosque and where, once a year, Jews and Muslims pray together, in the Ghriba Synagogue. On the Iberian Peninsula, where the Inquisition managed to destroy nearly every synagogue the film discovers two synagogues, in Cordoba and Toledo, who survived the ebb and flow of history. The film then travels to Amsterdam where it encounters the Golden Age. Here the Portuguese Synagogue proudly stands in the cityscape and attests to a then confident Jewish population. "Sacred Spaces" also takes the viewers into all five synagogues of the Venice Ghetto. These Ghetto Synagogues, with their modest exteriors, reveal nothing of the lavish and sumptuous interiors. Along with the extermination of Jews during the Holocaust, a major portion of their places of worship were destroyed. Some however survived. In Budapest, the Dohány Street Synagogue, the largest in Europe, remains an example of a living sacred space which remains intact. The Jews find refuge in the New World. There, Frank Lloyd Wright along with the guidance of Rabbi Mortimer Cohen, together design a modern synagogue in Elkins Park, Pennsylvania.